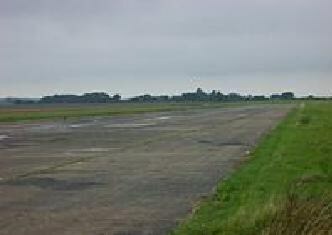 Beccles Airport (IATA: N/A, ICAO: EGSM) is located 2 nautical miles (3.7 km) southeast of Beccles, Suffolk, England. Beccles Aerodrome has a CAA Ordinary Licence (Number P837) that allows flights for the public transport of passengers or for flying instruction as authorised by the licensee (Rain Air (Beccles) Limited). The aerodrome is not licensed for night use. It was built for the USAAF and completed in 1943. It had the three concrete runway layout typical of many bomber airfields in East Anglia, and was allocated the airfield number 132. It is possible that Beccles was intended to be used by the 3rd Air Division, 95th Combat Wing. The 95th had two Bomber Groups, the 489th at RAF Halesworth and the 491st at RAF Metfield. Other Combat Wings had three Bomber Groups. In the event the USAAF had no use for the airfield so it passed briefly to RAF Bomber Command before passing to Coastal Command in August 1944. Until closure in 1945 the airfield was used by various RAF and FAA squadrons operating such diverse types as Vickers Warwick, Fairey Barracuda, Supermarine Walrus, Fairey Swordfish, Supermarine Sea Otter and Fairey Albacore on air-sea rescue and anti-shipping duties. The Fleet Air Arm used temporary lodging facilities at RAF Beccles under the stone frigate name HMS Hornbill II. After the war the airport remained dormant until 1965 when it became Beccles Heliport serving North Sea oil rigs until that operation transferred to Norwich International Airport. Beccles airfield has been home to RainAir since 1997 when Rainer Forster transferred his flight training operations from Swanton Morley.